Is writing stopping you from getting the Band score you deserve? 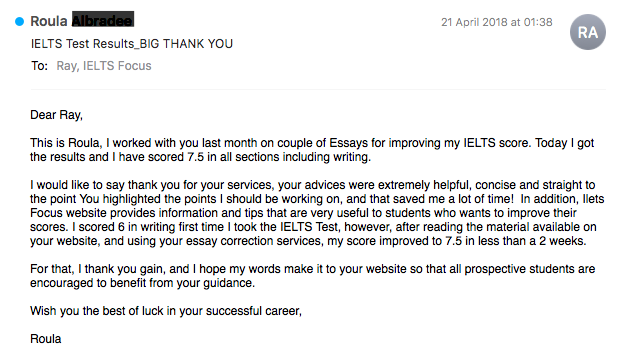 I have been coaching students in IELTS for 8 years and I have noticed that the biggest problem most students have is with the writing tasks. One of the reasons for this is that many students do not have a reliable IELTS teacher to show them what mistakes they are making. On top of that, many students doing IELTS have unrealistic expectations, such as aiming for a Band 7 with only one week’s practice. You need time and you need to be prepared to do the work. I can help you pinpoint your weaknesses and give you the feedback you need. Take a look at the video below for more information. Many students do not get the feedback they need to get a Band 7+ in the writing tasks. Are you still making the same mistakes again and again in your writing? Are you still struggling to get past Band 6 in your essays? Maybe you are tired of getting different advice from different teachers. 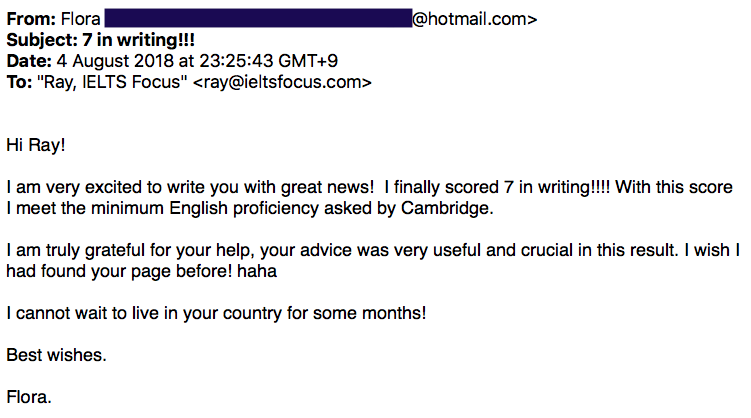 I will show you exactly what mistakes you are making and give you suggestions on improving your grammar and vocabulary. 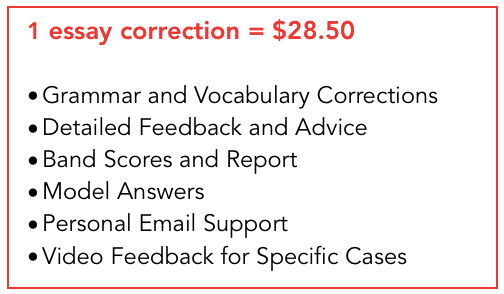 Through this correction service, you will get personal feedback on your writing and you can contact me personally by email if you have any questions or problems. I will mark your essay according to the official IELTS marking criteria: Task Response, Coherence and Cohesion, Lexical Resource, Grammatical range and accuracy. You will get an Examiners report and a Band score for each of the criteria , and you will get a Band score summary. You will also get a high Band model answer essay to compare with. This all includes links to resources online and lessons showing you how to fix your weak points in writing. In special cases video feedback is included in the form of a Private YouTube video detailing what areas you need to fix. How would you feel going into the IELTS exam knowing that you can write a high band essay? You will save money, time, stress and you will get the expert advice that you need. If you were to enroll in an IELTS writing course in a Language school it could take weeks or months and it would be expensive. 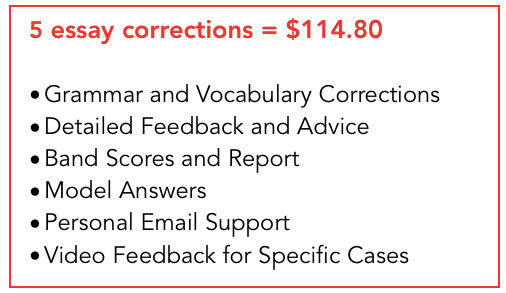 Using a correction service with an IELTS teacher guiding you, helps you improve faster and it’s more cost effective. How does it work? What happens when you buy this service? Choose the question you want to write about and email your writing back to me in your own time. You will also get free links to lessons showing you how to improve on your weak points in writing. In specific cases you will get video feedback in a private YouTube video. Through this process, you can see the mistakes you are making and you will be well on your way to your target Band score. 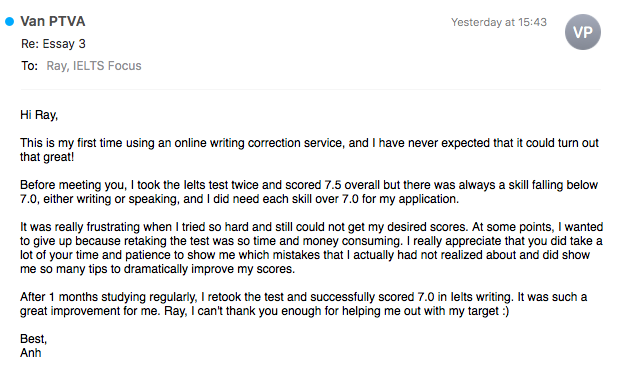 Here are some of the recent testimonials I have received about my writing correction service. Click on the Buy Now button. You will see a popup window, enter your address. 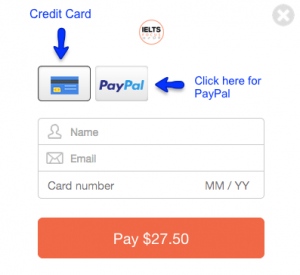 Then you will see 2 payment methods, you have a choice of either paying by PayPal or by Credit Card. You can either enter your credit card details or click the PayPal button. This transaction is 100% safe and secure. Once you purchase, you will get an email with an order number and a link where you can download the example task questions. choose a question, write your essay , email it back to me and I will correct it. This package will contain detailed feedback, clean up of grammar, suggestions for improvement, recommended links, Band scores and a model essay. Due to popular demand, the service is closed until April 23rd please check back then. When you pay for this service it will go through a special secure payment gateway. This is 100% safe and secure, your payment does not get processed through this website. I do not keep any of your personal information apart from your email address and name, which is never shared with anyone and I never send spam. I do not have any record of your credit card number. This is processed through a special secure payment system and used by them only. Yes, PayPal is an option, once you have entered your address, just click the PayPal button. Do you correct General and Academic essays? Yes, both types are corrected (general and academic essays are the same actually) , also writing task 1 general and academic. Can I send you essays on different days? Yes, I recommend sending one essay first, waiting for my feedback, then sending the next essay. This way you will learn from my corrections. When do I have to send you the essays? You can send in your essays anytime you like, it is flexible. Does one essay include writing task 1 and writing task 2? How long will it take to get my corrected essay back? You will get your corrected essay back within 36 hours. Where can I get the IELTS task questions? When you make a purchase you can then download the PDF with all the questions that cover IELTS academic task 1 and task 2 and IELTS general also. Yes , however they have to be IELTS questions from official IELTS sources such as ielts.org or official Cambridge IELTS exam books. If you do not have these then I recommend choosing a question from the PDF that you get when you purchase. Can you guarantee a Band 7 or 8 ? No, nobody can guarantee a high band score, be careful of any school promising a high IELTS score. The purpose of the correction service is to show you what mistakes you are making and guide you in the right way. 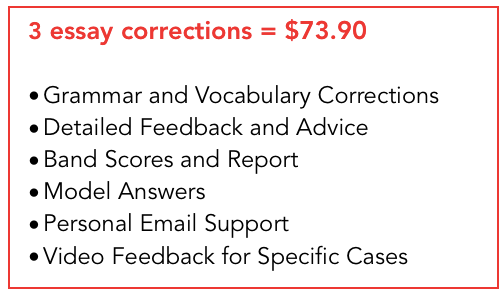 The correction service includes valuable feedback and an overall band score for each of the marking criteria. It also includes a model answer which is there to show you how a good essay is structured and what the examiner is looking for. I am stuck at Band 5.5 and my test is soon, can I get a Band 7 in two weeks? No, to jump from a Band 5.5 to a Band 7 will take time and effort. You have to be realistic and you need to work on your weak points to improve. This takes time, the learning process may take 6 months or more, it really depends on your motivation levels. From a Band 6.5 to Band 7 is more realistic in a shorter time period, as long as you work hard on fixing your weak areas. Do I get video feedback? In certain cases where I have to explain an issue with your writing or if there is a specific point that is easier to communicate with video, then I will upload a Private YouTube video with an explanation. These are usually around 10 minutes long.